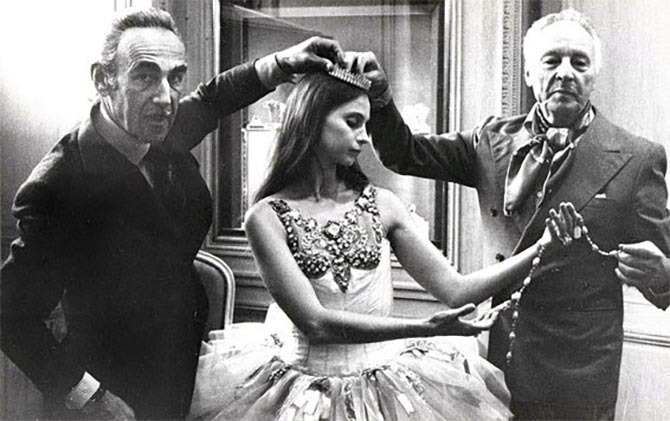 Before the 1967 premiere of the Jewels ballet in New York City, dancer Suzanne Farrell and legendary choreographer George Balanchine went to Van Cleef & Arpels to meet the press. The boutique was the perfect place to publicize the new production. Claude Arpels, a founder of the firm and his brother Pierre Arpels were friends of Mr. Balanchine and ballet enthusiasts. At the time, some journalists reported that Claude Arpels had suggested the idea of a ballet based on jewels to Mr. Balanchine. Other stories said the choreographer’s daily walks on Fifth Avenue by the Van Cleef & Arpels window-display of treasures ignited the idea for the ballet. Yet there could have been another source of inspiration that did not get reported by the press. 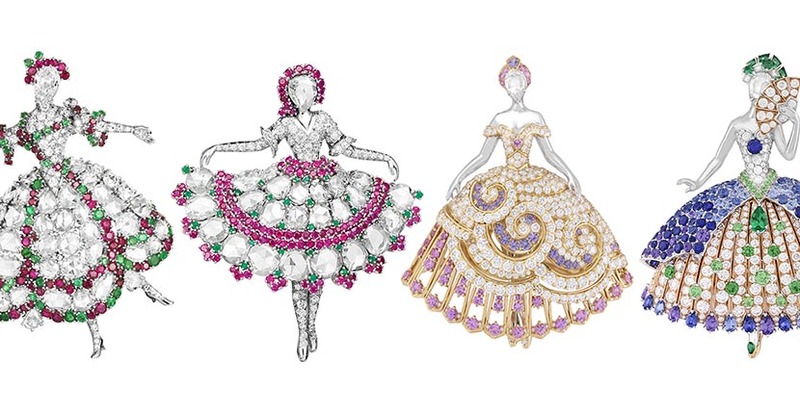 The ballet in three acts—Emeralds, Rubies and Diamonds—might very well have been inspired by Van Cleef & Arpels ballerina brooches. The illustrious choreographer of the New York City Ballet was familiar with the jewelry. He had even bought reportedly bought a ballerina brooch around 1944 depicting his wife Vera Zorina in an arabesque. Van Cleef & Arpels first started making the opulent badges of cultural appreciation soon after it opened a New York City flagship in 1939. The firm’s designer Maurice Duvalet created the sparkling troupe working in concert with the manufacturer John Rubel, (a Frenchman named Jean who Americanized his named when he moved stateside). According to legend, Rubel found inspiration watching flamenco dancers at a café on the Lower East Side of Manhattan. These creative outings might have resulted in one of, if not the first, in the Van Cleef & Arpels series. The 1941 piece depicts a Spanish dancer with a fan. Duvalet looked at cultural references and created designs inspired by the marquee names in the history of dance. 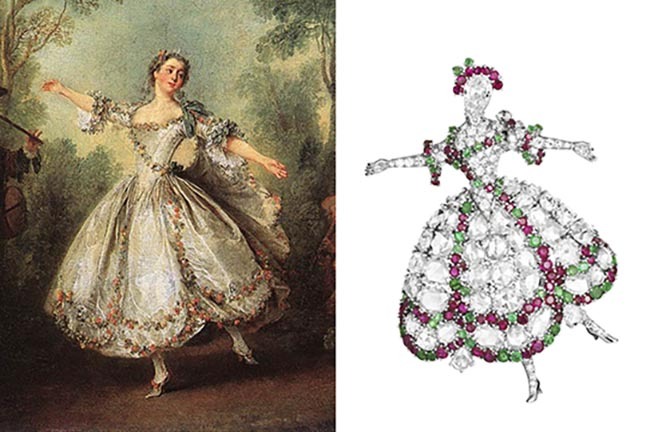 One jewel made in 1942 was inspired by an eighteenth-century French dancer, Marie Anne de Cupis de Camargo. Known as La Camargo, the dancer was famous for shortening her ballet skirt to calf length so the audience could see her movement. The Van Cleef & Arpels brooch designed in homage to the dancer was based on a 1730 painting by the artist Nicolas Lancret. 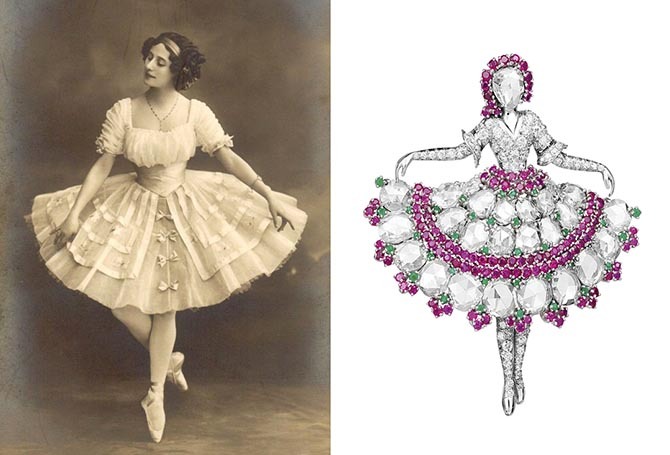 Late 19th century photographs of the Russian dancer Anna Pavlova dipping into a curtsy inspired another 1940s brooch by Van Cleef & Arpels. The prima ballerina in the Imperial Russian ballet and the Ballets Russes of Sergei Diaghilev was one of the first ballerinas to tour the world. 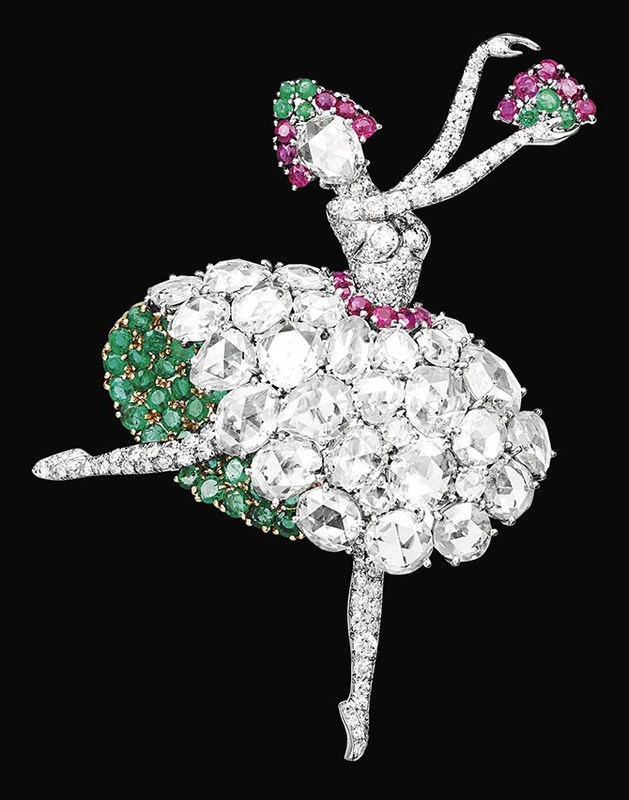 A who’s who of American jewelry collectors acquired Van Cleef & Arpels ballerinas. Marjorie Merriweather Post, Jessie Woolworth Donahue and Barbara Hutton, each pirouetted away with one of these little masterworks. Some of the dancers made in Paris during the 1940s were daytime jewels rendered in gold with turquoise and ruby skirts and rose-cut diamond faces. More splashy formal designs were usually made in New York and created in rubies, emeralds, platinum and rose-cut diamonds. The quality that unites all Van Cleef & Arpels dancers are the rose-cut diamond faces. The legend about the rose-cuts in the original series is that they came from the Spanish Crown Jewels. Supposedly, they were stones that were transported to Mexico in the 19th century and then sold at auction in New York much later. It’s a theory that’s never been fully explained, but certainly is possible. Napoleon’s armies were marching into Madrid in the early 19th century and there could have been a need to hide or dispose of the jewels. Whatever the case may be, Van Cleef had an abundance of rose-cut diamonds during the 1940s that it used in the ballerinas. The stones with facets all over the top (or crown of the stone) gave pieces a wonderful texture. While Van Cleef & Arpels ballerinas had a steady run in the jeweler’s collection from the forties through the late 1960s when they were retired for awhile. Over the last couple of decades, the dancers have been stars in the collections again. Among all the beautiful contemporary examples I have seen none were quite as remarkable as the 12 brooches that debuted in Paris during the 2018 Fall Haute Couture week. The dozen dancing ladies were inspired by the Grimm’s Fairy Tale, The Twelve Dancing Princesses. Each of the jewels is named and has a personality. I think it is perhaps this quality of individuality that makes them shine. 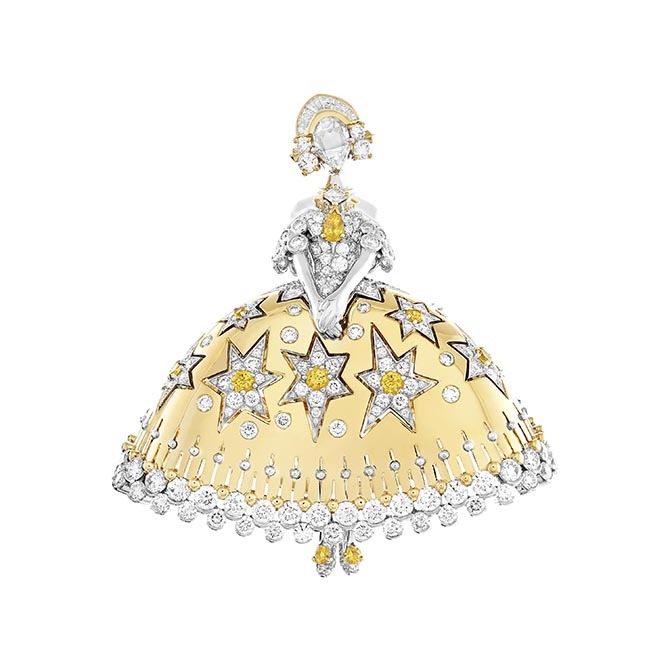 The Van Cleef & Arpels designers brought them to life in much the same way Maurice Duvalet did in his work inspired by ballerinas from the history of the art.